Disclaimer: I am not breaking any oath-bound secrets by sharing this. The Dryghten Prayer was published in its entirety in the book Witch Blood! The Diary of a Witch High Priestess by Patricia Crowther. It's also available on the web if you know where to look. and they who are now with us. Dryghten (pronounced dricht-ton, from Old English, see below) is a concept in Gardnerian Wicca that there is a self-aware energy pervading all things and places. It is omnipotent, omnipresent, and, most importantly, difficult (though not impossible) to access. It is comparable to other Pagan concepts such as Akasha, Spirit, the Web of Life, and the Star Goddess (as it is understood in some traditions). The Dryghten is "Male and Female; changeless, eternal" because it is perceived as the source from which all other Deities manifest. It is, in its most essential form, Panentheism. Qabalah, which posits that there is a divine source (Ain Soph) from which all of the Sephiroth manifest echoes this view. I mentioned that Dryghten is difficult to access from our current reality. This is, again, paralleled in Qabalah as Malkuth longing for union with Kether. Sometimes mystics will have experiences for Oneness or the Godhead, Universal Unity, the Monad, etc. Gardnerians see this as an experience of Dryghten. Because Dryghten is so difficult to access, it makes sense to honor it and work with it though lesser spheres of manifestation, such as other Gods and Goddesses. Thus, the Panentheist becomes the Polytheist. Old English comparison of words using "dryht" or "dryhten"
I included this list to show that "dryhten", as understood in Old English, means to be both holy and royal or of noble blood. Thus, in Old English, Dryghten has less to do with "the Original Source of all things; all-knowing, all-pervading, all-powerful; changeless, eternal" and more to do with that actual "Ancient Providence" divine kingship! 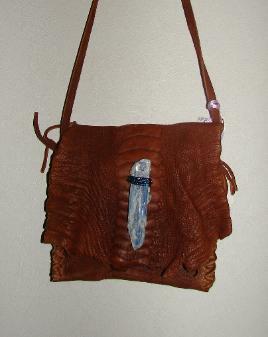 Alligator skin & blue kyanite bag. The Witch's Crane Bag is a small bag made of leather, skin, hide, cotton, linen, wool or other cloth, or any substance capable of holding a collection of things inside it. The Crane Bag can be of any size and composition, and it may be of any color or combination of colors. It may be held or connected to you in any manner. Crane Bags are often worn on the belt, around the neck, or over the shoulder. It is analogous to the Native American medicine bag. The Crane Bag of Celtic myth was owned by Manannan mac Lir (who is connected with cranes). It was fabricated from the skin of Aoife after she was transformed into a crane. This bag contained treasures which were only visible at high tide. These treasures include: Manannan's house, shirt, and knife; Goibniu's belt and smith's hook; the King of Alba's shears; the King of Lochlann's helmet; the belt of fish-skin; and the bones of Asal's pig. Many modern Druids carry Crane Bags as part of their regalia. What you place in your Crane Bag is entirely up to you. It is your medicine bundle where you can keep any spiritual objects that hold a special meaning for you. You may keep anything sacred to you in your Crane Bag and you need not share the contents of your Crane Bag with any other person whatsoever. Indeed, it is recommended that a Witch does not share all of the contents of her Crane Bag with anyone, but let it remain a mystery and a secret which will build numen. The Crane Bag is worn whenever a Witch wants protection, strength, and additional magical power. Like this post? 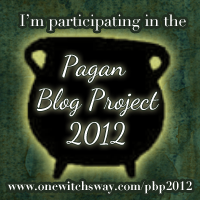 You can read more like it at the American Folkloric Witchcraft blog. The Blackthorn is a tree of winter. The fruits of the tree, known as sloes, ripen and sweeten only after the first frost. Sloe gin is made from these fruits. A cold spring is traditionally known as a blackthorn winter, as the blackthorn often bears its white blossoms while winter's chill still hangs in the air. The blackthorn has vicious thorns that can cause painful infections, and forms dense thickets when left to spread on its own. It has tough dark black bark, hence its name. Blackthorn's Gaelic name "straif" has connections with the English word strife. Its thorns as sometimes used in witchcraft as "pins" to pierce wax poppets. Some legends attest that the witches mark was made upon the flesh of a witch with a blackthorn thorn. 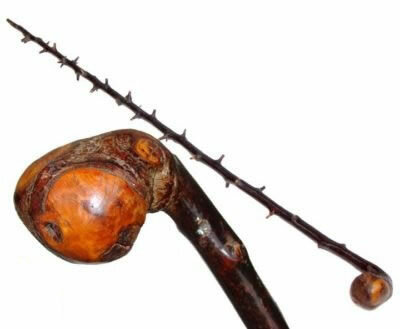 Blackthorn's wood is used in the creation of the Irish cudgel or shillelagh, which is an old traditional tool of the male leader of a coven. Blackthorn staves and wands are used in blasting/cursing magic. Byt weave of thorns I bar the Way! All spirits foul be fix'd upon Thee. And Darkness fall -- for thou Art bound! American Folkloric Witchcraft is a tradition created by myself and my partner Laurelei Black. Each of us has been practicing Witchcraft since the late 1990's. In that time we have developed some opinions about what we prefer and what we don't. We are both avid proponents of non-Wiccan Craft in the style of Robert Cochrane. We count ourselves as devotees of Tubal Cain and of the White and Black Goddesses. We have been shaping a path -- or it has been shaping us -- for several years. 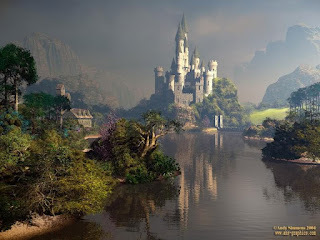 We have been inspired to share this work with others through the AFW Blog, well aware that any true mystery cannot be told, it must be experienced for oneself. We hope that our work can provide a guidepost to others who seek to practice the Old Ways in a new way. Our ways are inspired primarily by the works of Robert Cochrane/Roy Bowers, and Robert Graves. We have borrowed elements of other American groups that also work with Cochrane's materials, American Rootwork traditions, ancient European and Native American Shamanism, and a great body of many years experience working in occult traditions. We call this path American Folkloric Witchcraft mindful of the fact that although we work in a heavily British tradition of Craft, we ourselves are practicing in America. We are attuned to the unique energies of the land we live and work in, and understand that ours is an American expression of what began as a European mystery. We claim no lineage to any group or tradition, although we have both worked extensively in other groups and traditions. This path is our own, and is for those who bear the Mark of Qayin. It claims no authority other than the oaths and bonds we have taken to our Gods and our Ancestors. For children of the family at the age of reason, and for potential new members to the coven. Creates an informal bond between teacher and student. Greening lasts through a 6 – 12 month period, or until the age of puberty. For children of the family at the age of puberty, and for formally joining members to the coven. Creates a formal bond – the Red Thread – between the student and all members of the coven. Adoption lasts a minimum of a year and a day, or until the age of majority. For children of the family at the age of majority, and for naming the student as a witch. Marks the student as a fully-fledged witch. We hope you will join us as we walk down the Crooked Path. You can learn more about us at our blog here. on which the castle sits. the ancient stream of Lethe. to touch the vault of heaven. two Bears, one Crown, the Sisters Seven. seek Rose Beyond the Grave. by right of Scarlet Thread. but ones hallowed by the dead.